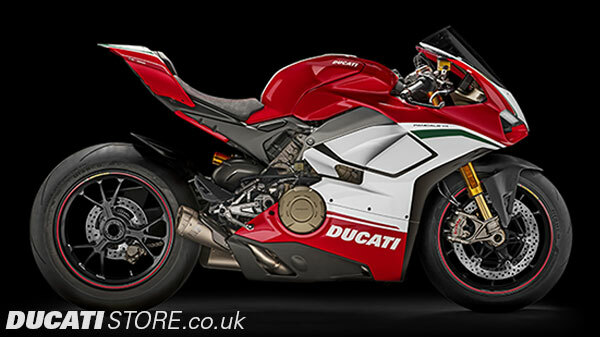 Ducati Manchester are pleased to announce details of the latest addition to the V4 family - The new 2019 Panigale V4R. 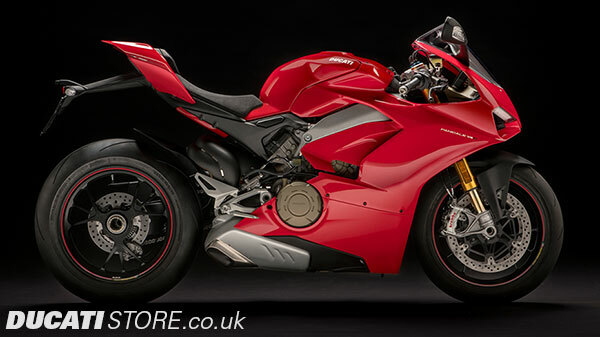 Order Your Panigale V4 Today by Calling Ducati Manchester, Preston or Stoke. Elegant, muscular, technological. 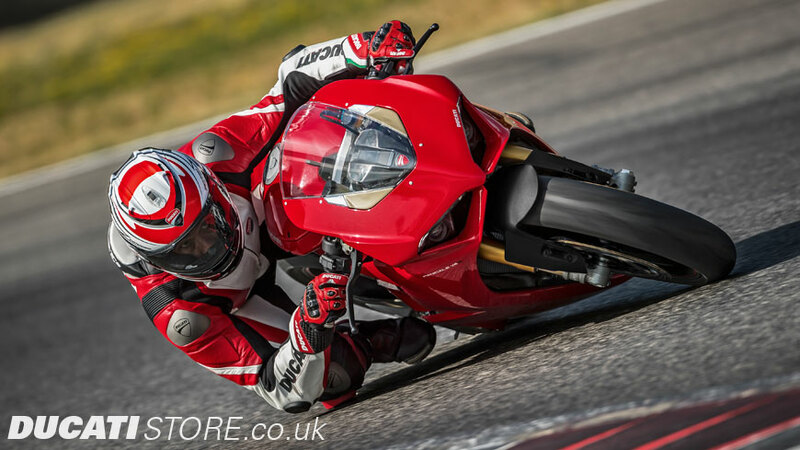 This is the essence of the style of the new Panigale V4. 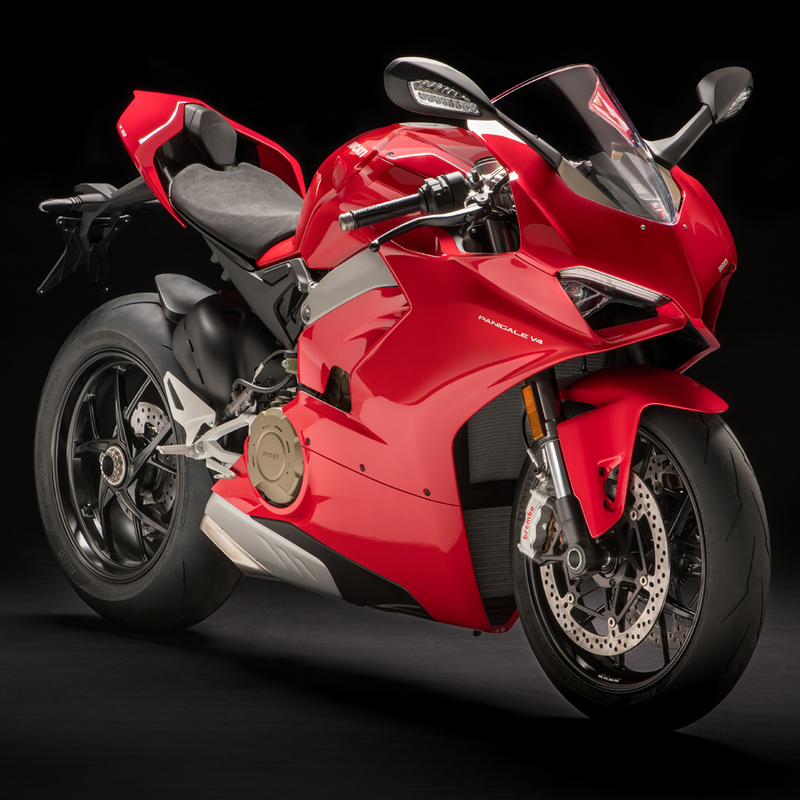 The Ducati Style Centre gave shape to the character of the bike and its performance following what for Ducati are the canons of Italian sports elegance: large and soft surfaces interrupted by few bold marks. Component integration, the idea of power and functionality have become dominant elements of the style and of the whole project. 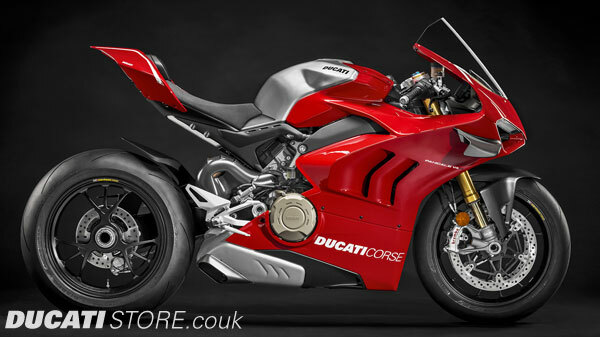 Contact Ducati Manchester for full details and offers on the new Panigale V4. 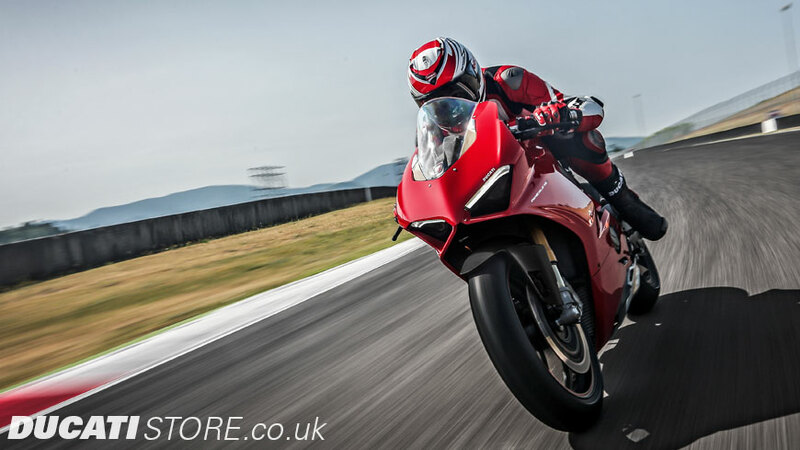 Contact us today to book a test ride or latest special offers on Ducati Panigale V4. 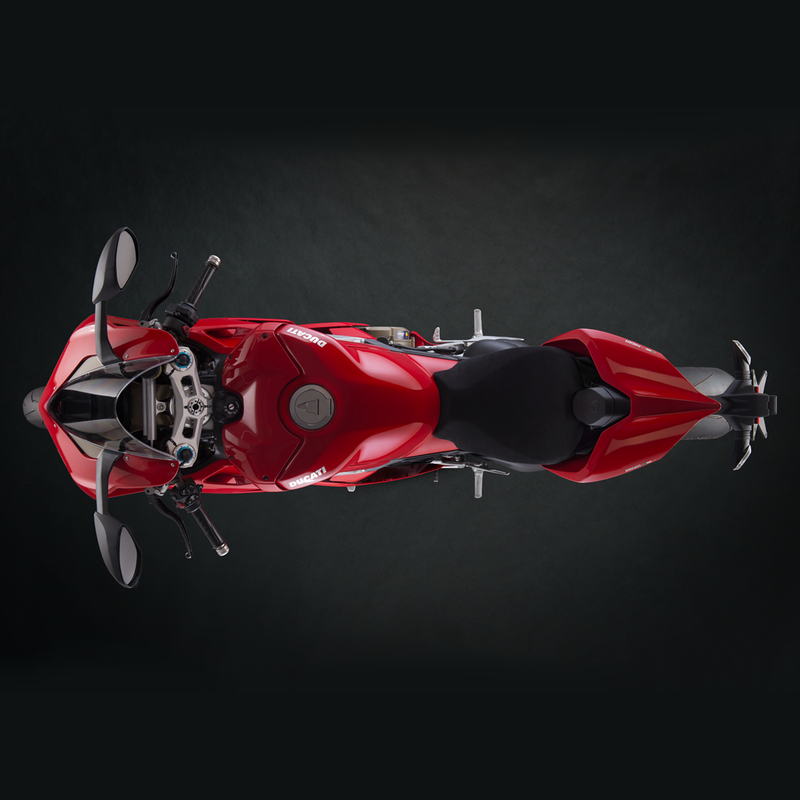 The new "Front Frame", left visible for all to see, becomes an integral part of the motorcycle giving it a tight fairing, practically custom tailored. The "Front-Frame" transforms the Desmosedici Stradale engine into a load-bearing component. This solution represents the evolution of the Monocoque structure and was born by making use of the experience gained in MotoGP. Compared to the Monocoque, the "Front Frame" makes it possible to decouple the torsional and lateral stiffness so as to achieve the proper amount of pliability with respect to the stresses on the frame, better absorbing uneven road conditions in the curves and ensuring the necessary stability. All this translates into a superior agility and precision that provides the rider of the Panigale V4 with an easier and less tiring control. The main difference in the layout compared to traditional solutions is the use of the engine as a structural element for the entire frame. The "Front Frame" features a compact frontal structure weighing only 4 kg, secured directly to the upper semi-casing of the front bank and to the cylinder head of the V4's rear bank, the engine block also serving as a connection point for the rear suspension and pivot point for the single swinging arm. The most important advantage of the "Front Frame" is the use of the Desmosedici Stradale engine to achieve the desired rigidity, making it possible to significantly reduce the extension of the main frame - and therefore its weight - achieving a superior rigidity/weight ratio. To this advantage is added the fact that the reduced length of the uprights running alongside the engine has made it possible to design a compact motorcycle, especially where the rider sits. The chassis is completed by the lightweight front subframe made of magnesium and the chill-cast aluminium seat support, secured on the top to the "Front Frame" and at the bottom screwed onto the cylinder head of the rear bank. The rear suspension exploits levers attached to the Desmosedici Stradale engine by forged aluminium. The levers react to the movements of an aluminium cast single-sided swinging arm. The plasticity of the "diamond" tank, a Ducati trademark, assists the rider at all stages of track driving. 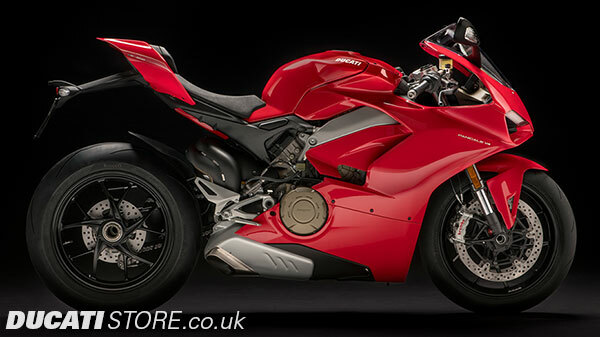 Thanks to its muscular shape it is possible to lean completely into the most extreme corners, lower the helmet for maximum aerodynamic efficiency in the straights and offer a strong lateral grip on the knees when braking deep into corners. It extends under the seat to lower the centre of gravity, thus leaving a portion of the subtail visible. The new Desmosedici Stradale engine has been designed based on the experience gained in MotoGP. The typical approach used in competitions is found in the extraordinary power and torque values: the 90° V4 with a displacement of 1,103 cm³, the counter-rotating crankshaft and the 4 valves per cylinder with desmodromic distribution that reaches 214 hp (157.5 kW ) of maximum power at 13,000 rpm and 122 Nm (12.44 kgm) of maximum torque at 10,000 rpm. On the Desmosedici Stradale the design of the desmodromic system is a key factor for obtaining top performance. The Desmodromic system in the Desmosedici Stradale uses components that have been completely redesigned and miniaturised to obtain very compact heads, achieving a level of sophistication, compactness and lightness never seen before on a Ducati bike. Each component of the system was designed and tested to safely reach the rotation speeds the V4 is capable of achieving. Also contributing to the compact engine heads are the new spark plugs, smaller than the standard model currently in production. The four camshafts of the Desmosedici Stradale engine move the 16 steel valves, the intake valves having a diameter of 34 mm and the exhaust valves measuring 27.5 mm in diameter, quite large in relation to the 81 mm bore adopted. The valve seats are made of sintered steel. Given the V4's high rotation speeds and the large size of the valves, the latter could not follow the cam closure profiles using a traditional spring system. This is why the Desmodromic system becomes indispensable. 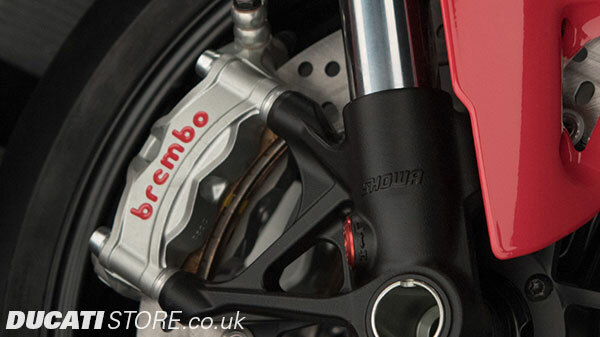 In Ducati's "Desmo" the valves are mechanically closed with an accuracy similar to that of the opening phase, making it possible to realise more pronounced cam profiles and extreme timing that optimise the dynamic flow of fluids both during intake and exhaust and therefore greater performance of the engine. The camshafts are controlled by two “silent” timing chains. On the front timing system the chain drives the intake camshaft, which in turn transmits motion to the exhaust via a pair of gear wheels (mixed chain-gear timing system). On the rear timing system, on the other hand, the chain drives the exhaust shaft which transmits motion to the intake line. This choice minimises timing absorption, benefiting performance and reliability. The chain that controls the timing of the front cylinders is positioned on the right side of the engine and is driven by the crankshaft through a gear on the sprocket of the primary transmission. The one that drives the rear cylinders is situated on the left side of the engine and is driven by a gear that is part of the crankshaft. Each head has an "anti-beat" sensor that makes it possible to optimise the management of advance firing, avoiding knocking phenomena. The performance of the Desmosedici Stradale must always be easily manageable to achieve maximum racing results, optimising the energies and concentration of the rider. The new Panigale V4's control electronics use the six-axis inertial platform data (6D IMU) that make it possible to capture and record extensive amounts of information. The Bosch ABS system, equipped with "Cornering" functionality that engages the ABS even when the bike is leaning into a curve, has evolved extensively with the introduction of new intervention logic and control types. Bosch EVO ABS Cornering can be set to three different levels to fully meet track and road driving needs, even in the most critical low-grip situations. While level 3 is indicated for the road or for low-grip conditions, thereby ensuring safer and more stable braking, levels 2 and 1, which give priority to braking power, are more appropriate for racing on high-grip surfaces and racetracks. Level 2 selection makes it possible to safely slide into curves for better performance in sports riding. 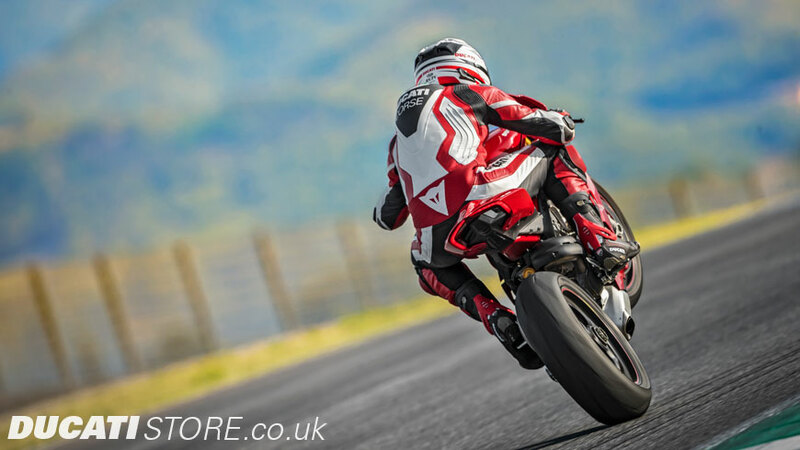 Level 1 of the ABS, recommended for use on the track, engages ABS only on the front brake, but maintains the "Cornering" feature that allows braking deep in the corners and to recover from any riding errors. 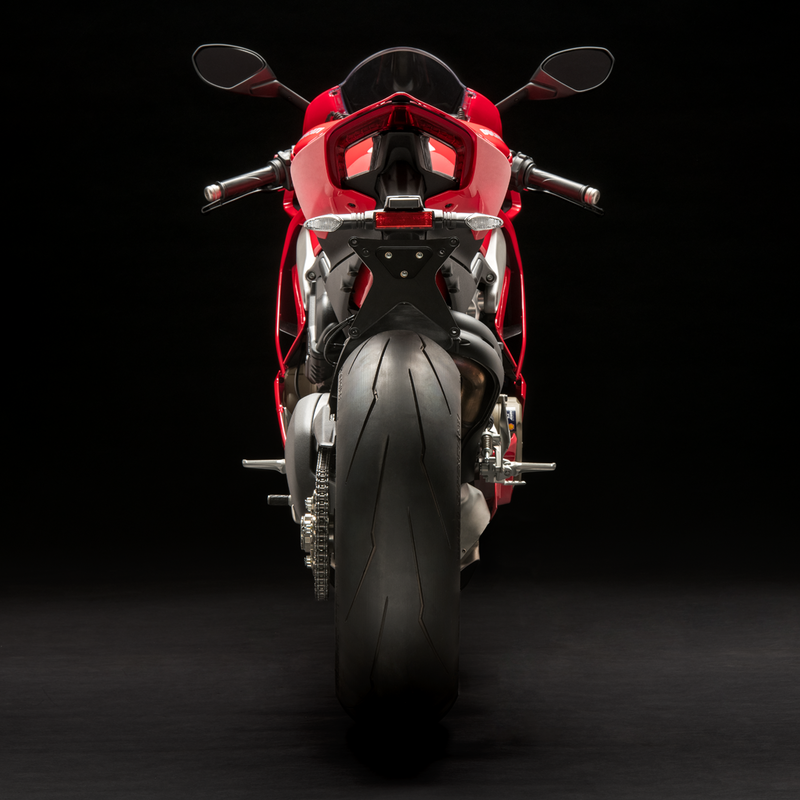 The DTC EVO on the new Panigale V4 is based on an algorithm that makes its interventions more precise and quick. The DTC EVO interfaces with the Bosch Inertial Measurement Unit (IMU) by constantly measuring the bike's angle and using this information to better judge the actions necessary to ensure ideal slipping of the rear tyre (depending on the DTC EVO level set). Additionally, the DTC EVO provides for the intervention of throttle body valves as well as the management of advance firing and injection. In all situations where a rapid intervention of DTC EVO is not required, the use of throttle body valves makes it possible to maintain optimal combustion parameters, resulting in a more fluid intervention and response of the Desmosedici Stradale. With simple traction control, when slipping of the rear tyre is detected the system will intervene to control it. When the grip returns to optimal levels, the system reduces its engagement until the slipping occurs again. And the cycle repeats. This translates into a chart in which the intervention oscillates around a theoretical "line of ideal intervention" that represents the traction limit. The DTC EVO reduces the magnitude of these oscillations by orienting the system to engage near the perfect line of intervention. This kind of behaviour is particularly advantageous as it interferes minimally with the dynamic balance of the motorcycle. 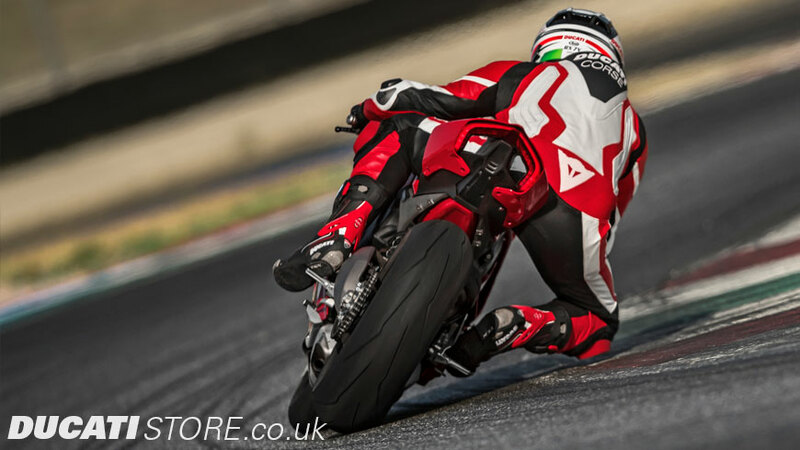 Furthermore, the system is designed to be more robust and consistent, making it possible to maintain a constant and predictable behaviour even when the grip changes, as in the case of rear tyre wear. In addition to the greater precision of intervention, when set to level "1" or "2", the DTC EVO adds a new function called "spin on demand" that allows the rider to control the bike at a level previously only achievable by expert or professional riders. Now, when the bike is cornering, the rider can use the throttle to request slippage that is greater than what is achieved with the normal level of intervention so that the motorcycle, pivoting on the front wheel, can oversteer the curve. The DTC EVO makes this possible while keeping the safety parameters under control, making it possible to oversteer with the rear wheel. 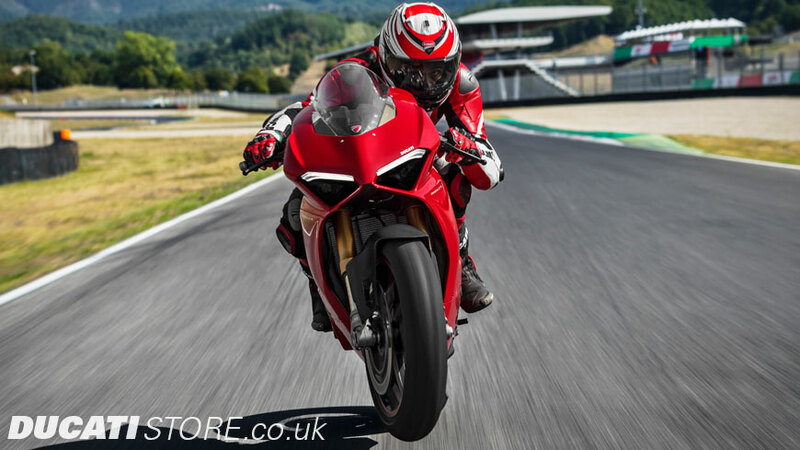 The new Panigale V4 sets new absolute performance benchmarks and raises vehicle safety and dynamics control standards with a state-of-the-art electronics package that maximises the potential offered by Bosch's six-axis inertial platform. Other original controls have also been introduced, like controlled slides during braking, ABS Cornering that acts only on the front brake with a setup that was designed specifically for track riding, and Quickshift Up & Down with a strategy that takes into account the lean angle. 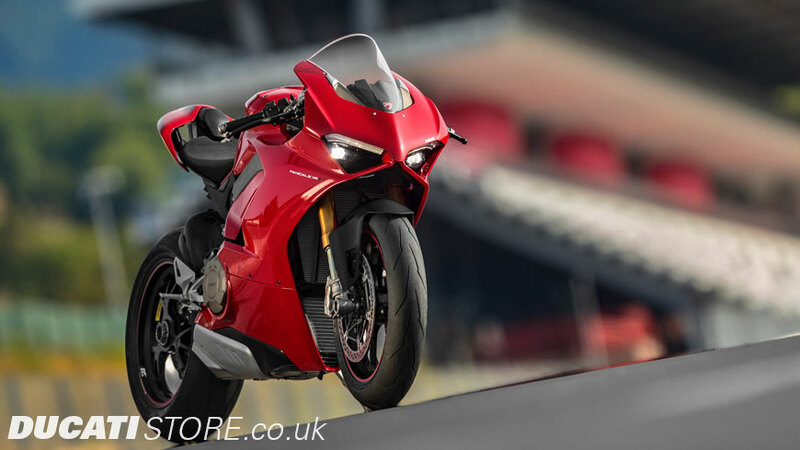 For 2018 Ducati have a selection of stylish and functional parts and accessories made specifically for the Panigale V4. 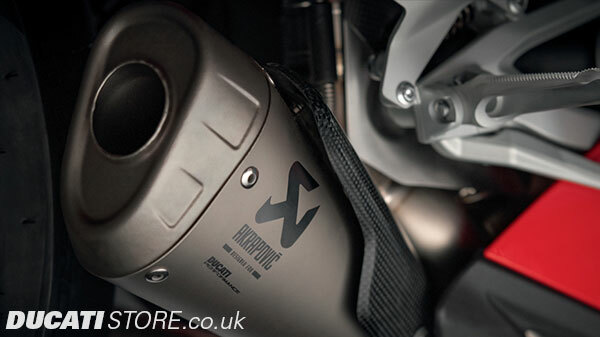 A range of accessories to enhance your Panigale V4, including Rizoma, Ducati Performance, Akrapovic Exhaust, Carbon Fiber and more. 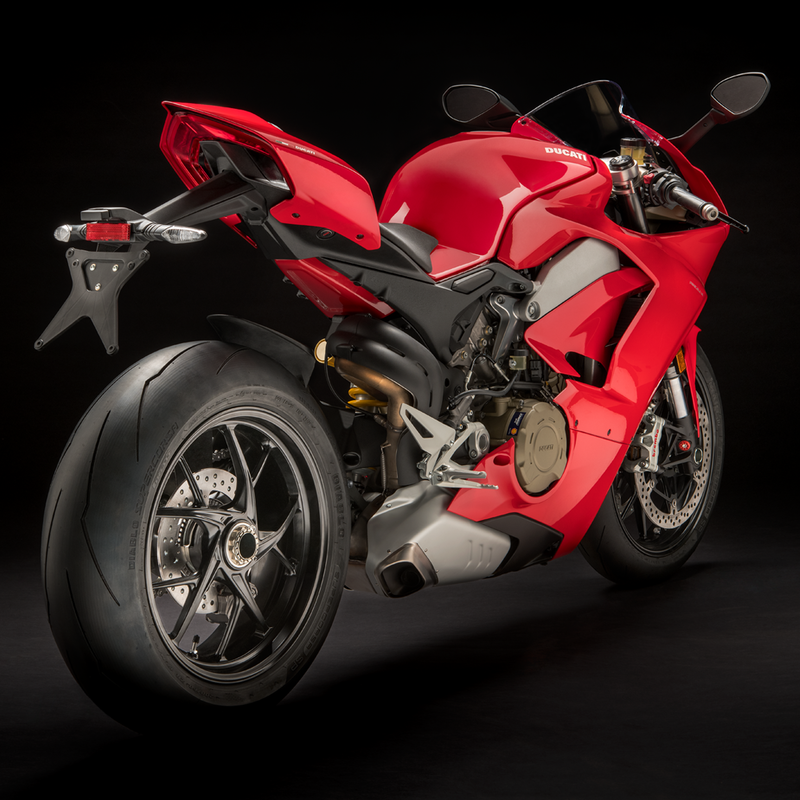 Ducati and Pirelli worked hand in hand to develop the new Panigale V4, the first motorcycle ever to feature as factory equipment the new Pirelli DIABLO Supercorsa SP 120/70 ZR17 at the front and the revolutionary size 200/60 ZR 17 at the rear. 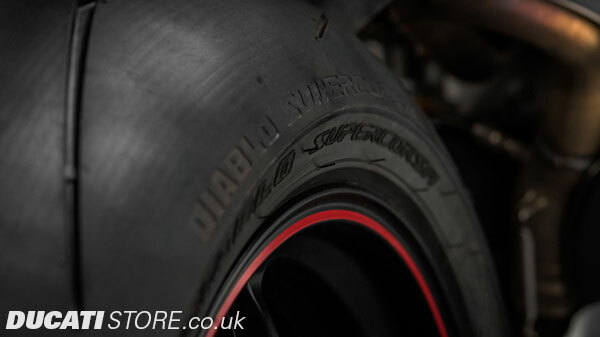 The latest version of the DIABLO™ Supercorsa SP, in the new 200/60 ZR 17 size already popular as a slick option in the FIM World Superbike Championship, is a pioneer in the field of racing replica tyres. 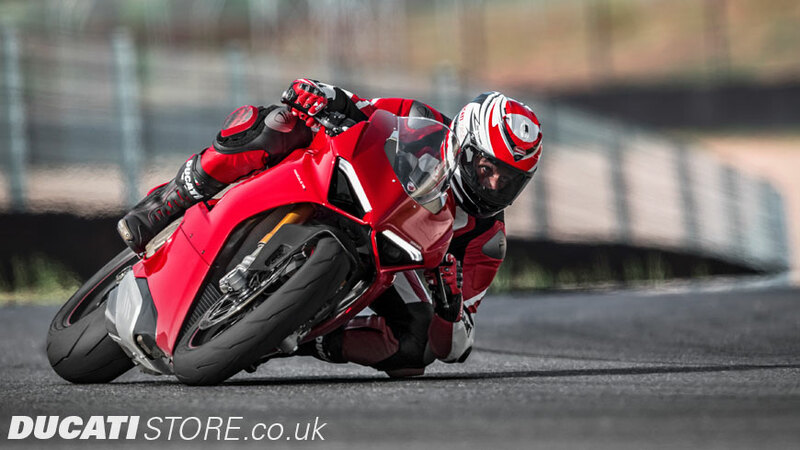 To celebrate the launch of the new Panigale V4 Ducati has produced a range of motorcycle clothing and apparel for 2018. 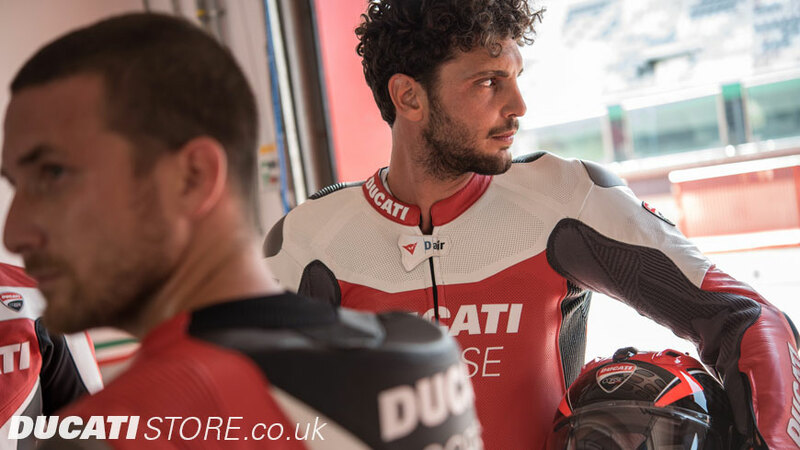 At Ducati Manchester you will find a large selection of rider clothing and accessories for sale in our showroom or in our online store. 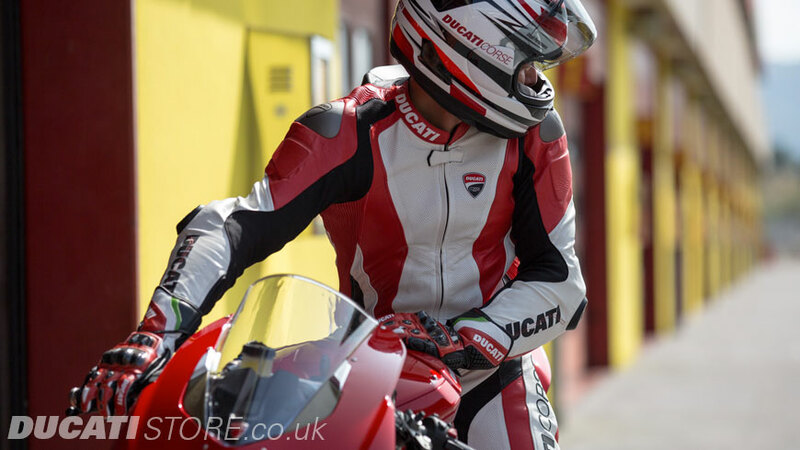 Ducati clothing, jackets, helmets and riding gear provide unique style & design, while offering high levels of safety and quality. 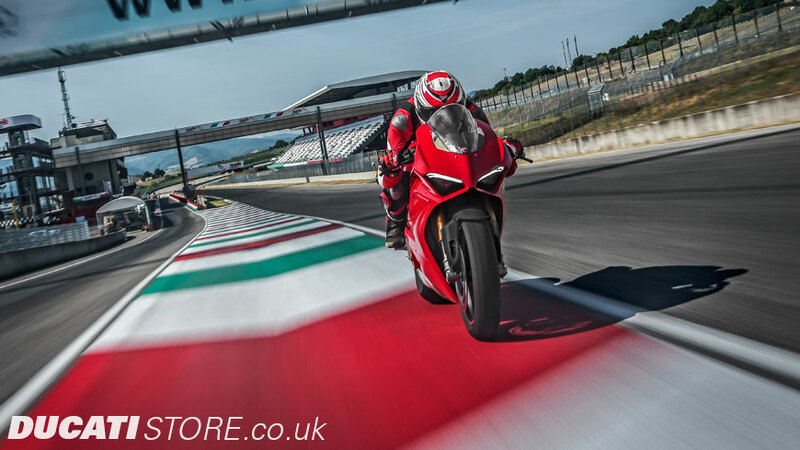 Get in touch with us today to arrange a test ride, enquire about financing, or learn more about the new Panigale V4.